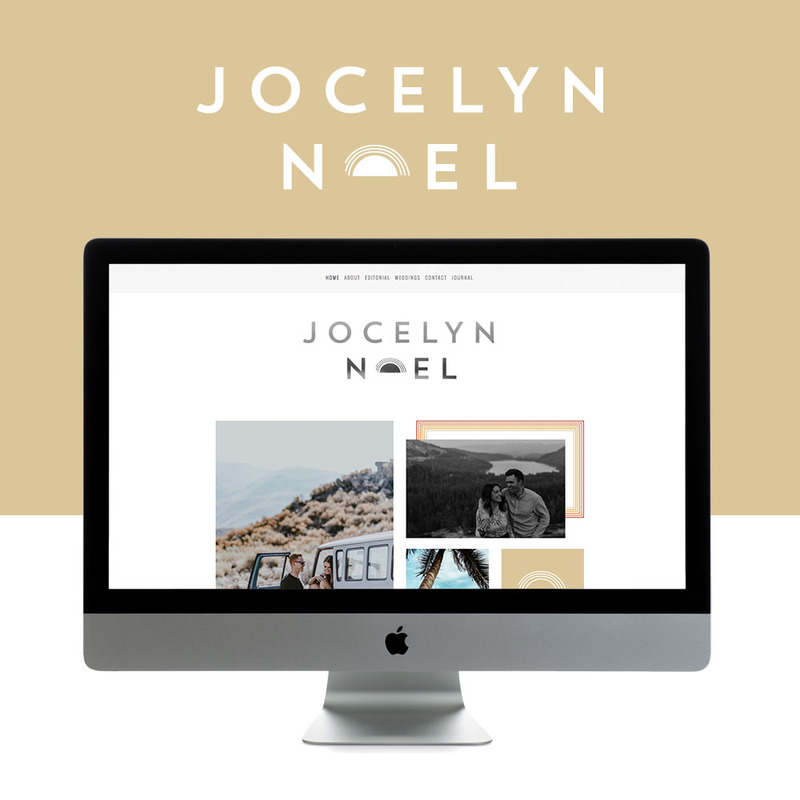 Photographer and adventurer Jocelyn Noel officially has one of the coolest sites on the web! Think retro, desert vibes and killer branding, plus the most beautiful wedding and editorial photography. We are in LOVE with the new site, a Restyle of our Everyday Template. Working with Jocelyn was a dream and her vision was amazing. Her photography is for “the wild ones, the risk takers, and the mischief makers” and this new design beautifully captures her vision. Designing her logo was one of our favorite parts of her design week. She wanted something with simplicity, but that would capture her vision and we couldn’t be more excited about how it turned out! Check out our Q&A below to read more about Jocelyn and her journey to becoming a photographer! "Creating space to truly live and enjoy this life we've been given is my ultimate goal with owning my own business. And capturing those moments or exciting those moments in others, ahhhh, there are no words. I'm in love." Jocelyn was always passionate about a slower lifestyle, being her own boss, and choosing her schedule. After trying a few different careers, she landed on a passion for photography and never looked back. Jocelyn: Started as a passion for a lifestyle. Of being my own boss; being as busy or not busy as I wanted. I tested out careers ranging from training horses, to slinging coffee, to working emergency medicine on the ambulance and on ski hills; when I finally landed on photography, I knew this was it! I haven't looked back since. GO LIVE: Did your education help prepare you for the industry or are you self-taught? Jocelyn: Self-taught in this specific industry, but I believe that I had continued education building up to this point. From my parents being entrepreneurs to learning the very best customer service and keeping cool under crises with emergency medicine. Jocelyn: That my work as a photographer IS an actual business and to succeed, I need to treat it as such. Jocelyn: I had been met with a lot of opposition from those close to me when I finally pushed into being a photographer. Including successful entrepreneurs and small business owners. I would have loved for someone to come along side me, and say "Yes. Do it. AND here's HOW to run a successful business." Rather than simply a "no, it's probably not smart for you to do this." Jocelyn: Honestly? Rock bottom. I had attempted doing what others wanted me to for too long and kept running into dead-ends. I had dabbled working for myself for several years, but always kept it as a side gig with other jobs taking priority. I dived in without looking back after suffering a severe head injury from a skate board accident. Within several weeks time from the accident, my life was turned upside down and I was left 10k in debt with stacks of medical bills, and no job, no car and scrambling for a place to live. At that point, it was really more of a "f*ck it. Why not?" idea vs "I should do this." Within 2 years time, all debt was paid off, I owned one of my favorite cars and lived in a house I had fantasized about, not to mention extended time off to take all the ski tours (one of my favorite hobbies)... all due to my business, handwork, and an incredible community that saw potential in me before I did. GO LIVE: What things have you gained / do you hope to gain in your life from following this dream? Jocelyn: My heart beats and my mind is at rest when I'm in the middle of the wilderness, with my favorite people, no cell service, and mountain ranges stretching for as far as the eye can see. Or when I'm walking down the sidewalk and I see an extra bright flower dancing in the breeze. Or when I take an extra 15 minutes to play in my daily yoga practice. Creating space to truly live and enjoy this life we've been given is my ultimate goal with owning my own business. And capturing those moments or exciting those moments in others, ahhhh, there are no words. I'm in love. GO LIVE: Anything else we should know or want to get off your chest? Jocelyn: Ha.The team absolutely killed it. I'm not an easy client to work with and they were able to weed through my indecisiveness and messy communications and come out with a quality product that truly reflects my brand. Want this look? Get the Everyday Template! Noble Presets is Live on Squarespace!